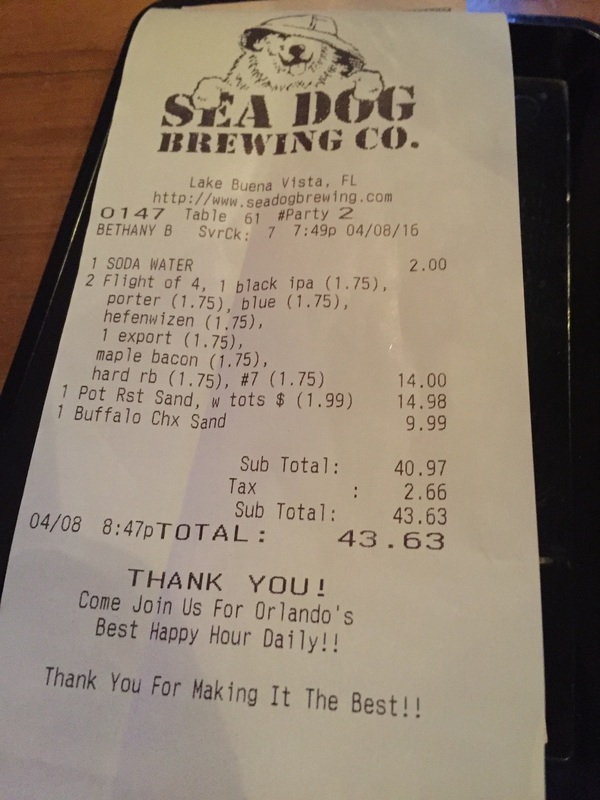 The Orlando area has plenty of brewpubs and microbreweries scattered around town, but one everybody seems to forget about (or ignore) is Sea Dog Brewing Company, located just outside Disney. So yeah, it’s a tourist trap within a tourist trap (which isn’t necessarily a pejorative). 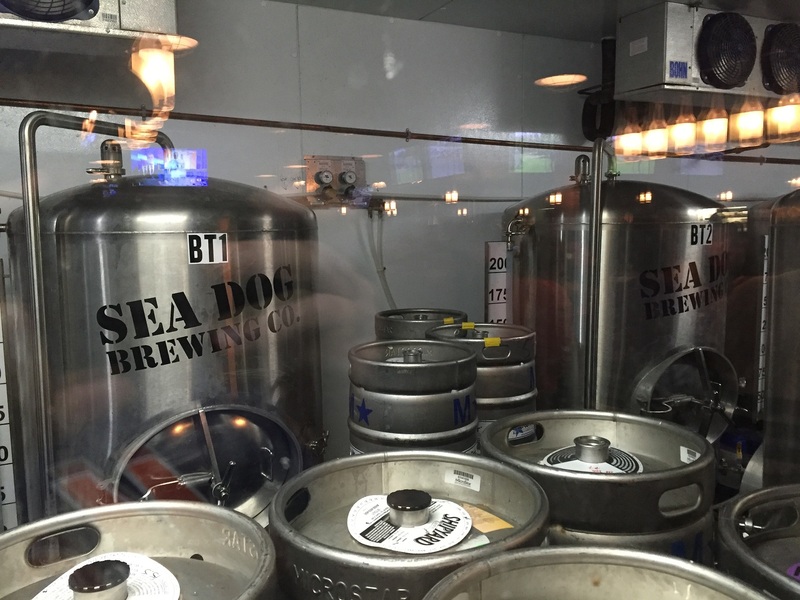 From what I understand, Sea Dog started out as an independent brewpub up in Bangor, Maine, but was acquired by Shipyard Brewing Company at some point in the 1990s. 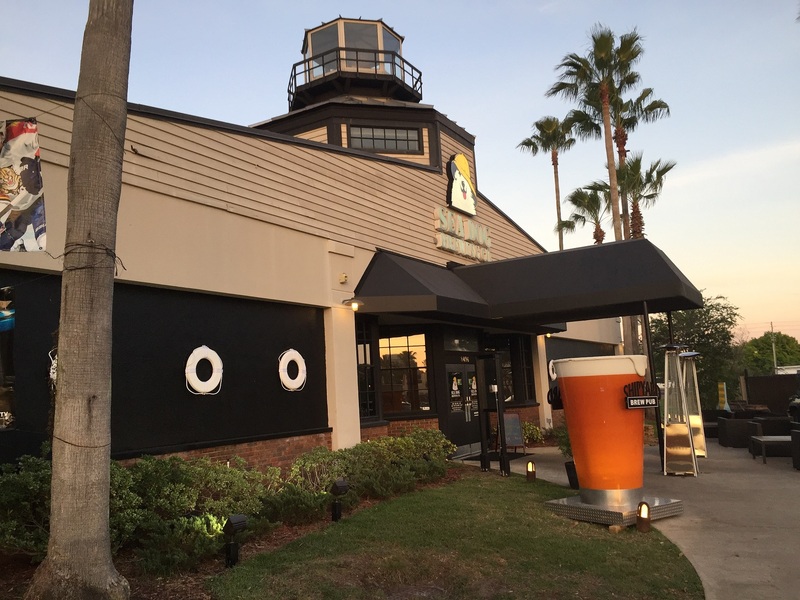 Shipyard brews all the Sea Dog offerings at their production brewery in Portland, and has opened a few Sea Dog restaurants around New England and two here in Florida. Whether each location actually brews its own beers on site is a bit of a mystery. The Orlando location has what looks like a nano brewhouse, but upon closer inspection, seems to be just a cold room for storing kegs. I didn’t see a mash/lauter tun in the room nor a boil kettle or any fermentation tanks, so I’m not sure where the suds are actually conceived. But anyway, let’s discuss the restaurant itself. I see bright tanks, but where are the tuns and the boil kettle? I went with my friend Maggie on a Friday night. I figured it would be packed given the time and location, but it was only at about half capacity. The atmosphere is the standard American family-friendly casual dining motif. 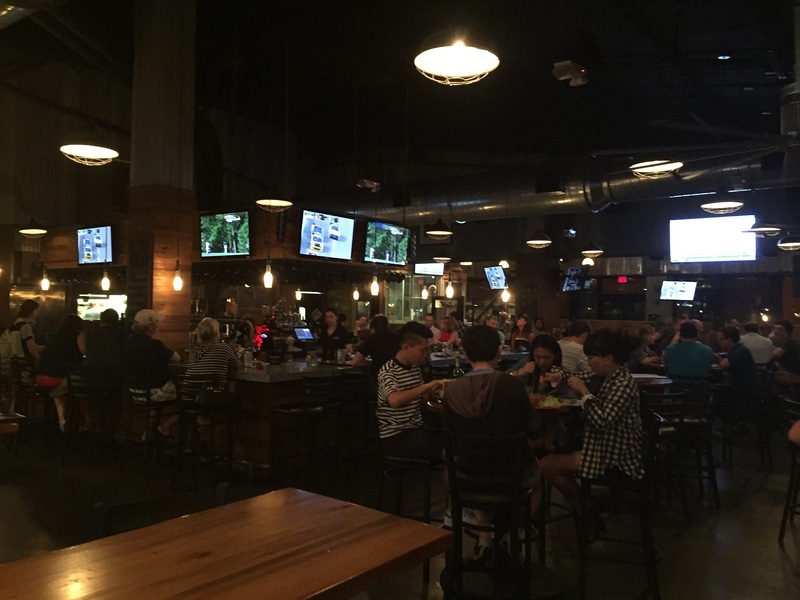 Tons of TVs scattered about; plenty of seating both indoors and out; a clean look; and a generic menu. They’re playing it safe here, so don’t expect to see anything particularly original, interesting or bizarre on the menu (except maybe the “Lamb Lollipops”). 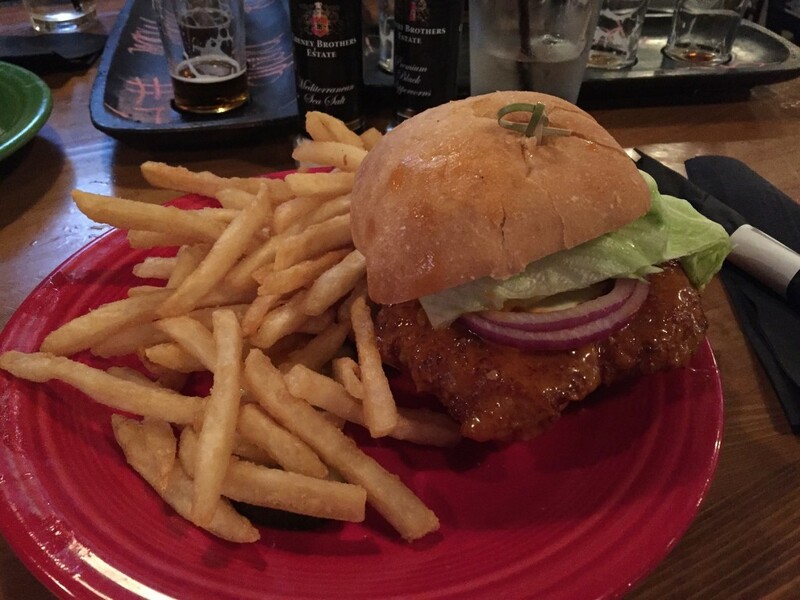 If you want a burger, steak, salad or seafood you’re going to get the same quality here as Applebee’s or Friday’s. 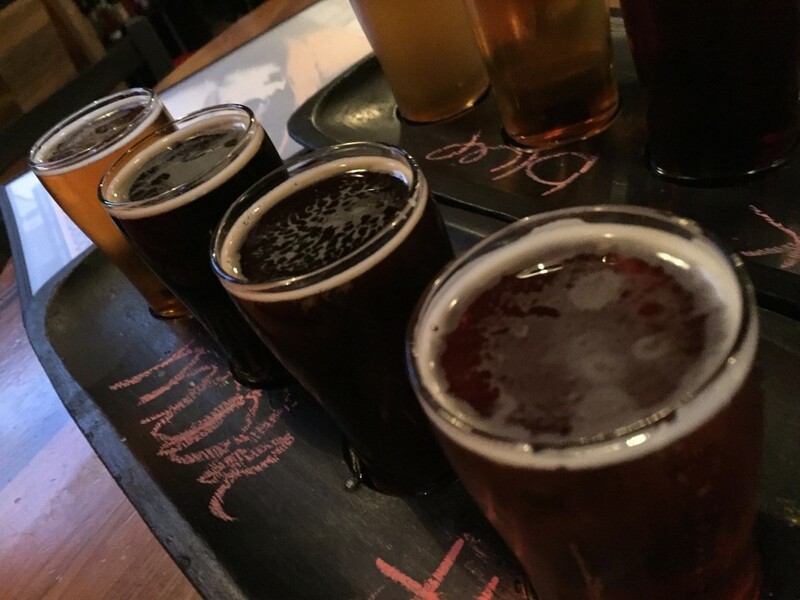 But this is a beer blog after all, so let’s talk about that. Overall, the beer was not very good and I’m not sorry we didn’t get to try all 16. 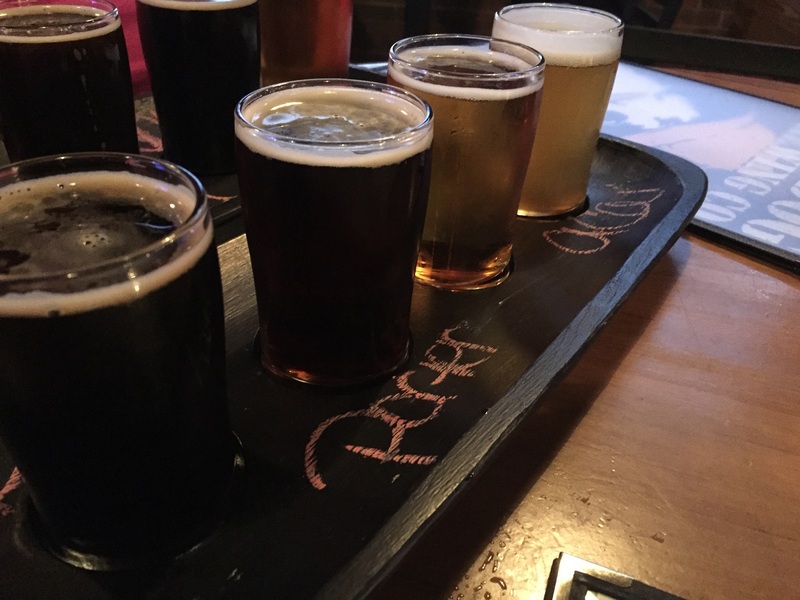 I could see some of these brews appealing to the non-beer enthusiast (especially the lighter beers), but beer geeks will probably be disappointed by the lineup. looked like something you’d get at Wendy’s. In fact, it even tastes a bit like a fast food item, as the sauce was quite mild, though the chicken was plump and juicy. 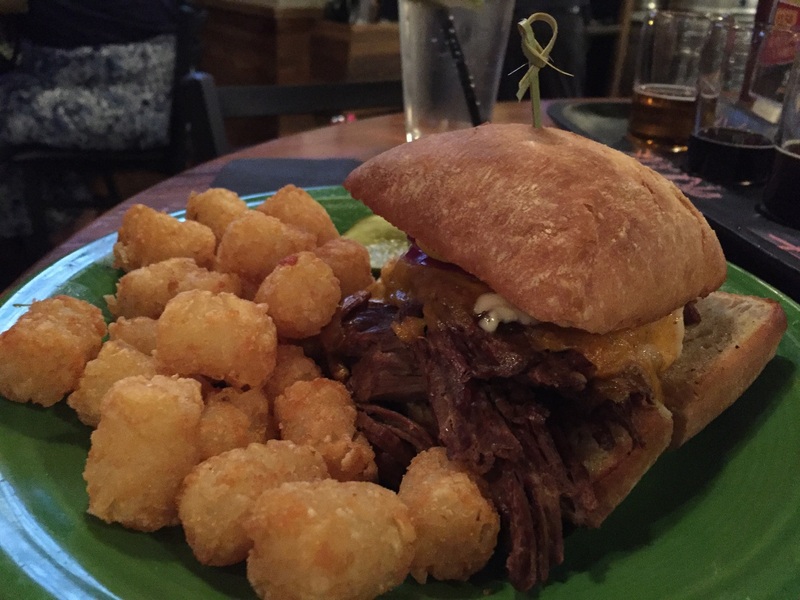 Maggie tried the pot roast sandwich, which definitely tasted like pot roast, but also seemed a little fast food-ish. The fries and tots were good; I’m sure they’re the same brand carried by restaurants like this everywhere. The service, much like the food was adequate. Not bad exactly, but far from great. In fact, “adequate” seems to be the best adjective to describe our experience here. If we’re going by a pass/fail rubric, Sea Dog earns a passing grade, but on a more nuanced scale it’s rather average. Still, between our two meals and the beer the tab was only $44 and we left an $8 tip. That’s not bad for a Friday night dining experience in a tourist trap area, eh?